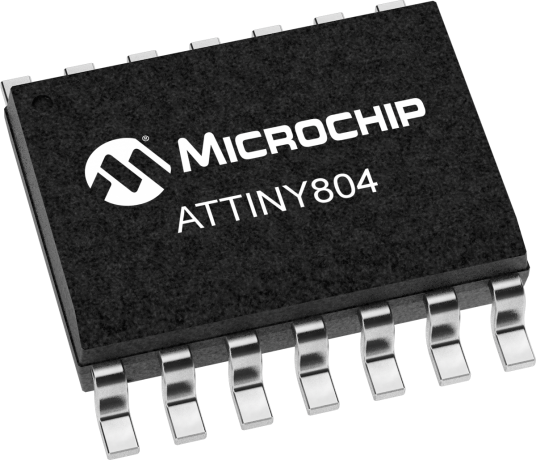 The ATtiny804 is a microcontroller using the 8-bit AVR® processor with hardware multiplier, running at up to 20MHz and 8KB Flash, 512B SRAM and 128 bytes of EEPROM in a 14-pin package. The series uses the latest technologies from Microchip with a flexible and low power architecture including Event System and SleepWalking, accurate analog features and advanced peripherals. The Secure AVR® BLE IoT Node incorporates an ATtiny1617 microcontroller, a fully-certified RN4871 Bluetooth® 4.2 Low Energy module, an ATECC508A CryptoAuthentication device and a 3-axis accelerometer with temperature sensor to demonstrate a complete solution for a typical IoT end node. The board is powered by USB or CR2032 coin cell via a jumper.